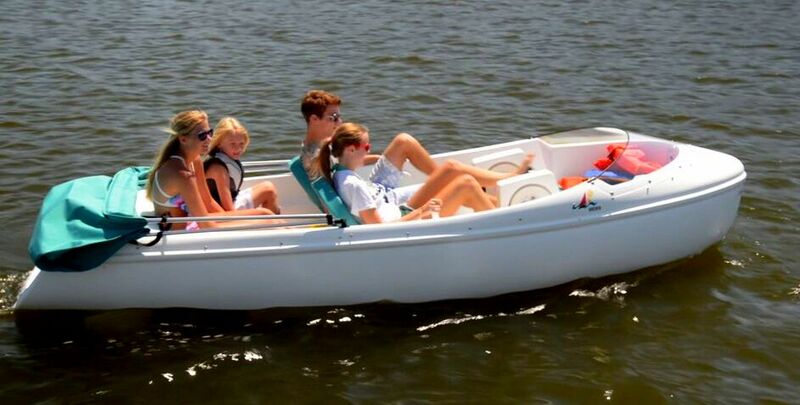 The two/three person Escapade Pedal boat delivers ultimate stability. With its ballast filled-keel, it provides for a more efficient pedal if you encounter current or windy conditions. It even made it into the Guinness Book of Records for crossing the English Channel! This boat provides for a comfortable ride with its fully padded recumbent operator seat and dual steering handles along with a rear bench seat that fits 1 to 2 people. Its built-in manual bilge pump makes for easy rain water removal while the molded-in swim platform provides for easy re-boarding after a refreshing swim. The one-to-two person Sprite Pedal boat, with its comfortable recumbent seating, allows for 2 people to pedal side by side. By removing one of the swing-up drive units it becomes a single person pedal boat. Its’ removable drive units and lack of deep keels enables easier beaching. Its “all in one” drive system is unlike the other drive systems in the Nauticraft line. No drive shaft is needed, as the propeller is attached to the drive unit itself for ease in removal and use. With its self-bailing feature, this compact boat is our lightest boat and makes this particular model easier to maneuver both across land and getting it in/out of the water. The four-person Encore boat is the perfect boat choice for couples and families. As our largest boat, it accommodates two passengers and two pedalers and is available in three different models. This boat is self-bailing – and with its molded-in swim platform for easy re-boarding and fully padded recumbent side-by-side seats with bench seat in the rear – it will make a day on the lake that much more enjoyable! The Encore P (Pedal) boat, with its independent drive systems, allows the two operators to pedal at their own cadence or rhythm with one person in control of steering. The Encore P/E (Pedal/Electric) boat retains the pedal drive system of the Encore P and allows either or both of the Encore operator’s to take a break from pedaling and use the electric option. The electrical components are hidden away under the front storage compartment – still giving you plenty of leg room. The Encore E (Electric) boat provides for total relaxation as the boat does the work for you. No pedaling is required as all of the power comes from the 55 lb. thrust Minn Kota salt water electric trolling motor.